In the previous post, I mentioned a lesson learned in my graduate program: history does not repeat, it echoes, and historians are responsible for those echoes. We choose how to control them. We emphasize events or omit words in the name of editing, of clarity, or willful distortion. We have to pick what to preserve because we can’t save everything, and decide what stories should be told because we can’t tell every one. These amplified echoes become history. Eventually, they become fact. The real version of what happened. Personal motives abound, and the first thing one should learn when reading histories is to search for the author’s bias, because it is omnipresent. The responsible historian tries to minimize their own impact on the narrative, but by the simple act of writing, they make the narrative their own. “…wondering at a social system, set of beliefs that is strong enough to get men to give up their lives for ideals that are so vague–aims that area actually so far away from what we know as reality.” Letter 40. Of course, this extends back to original source material as well. What is recorded and what is omitted. 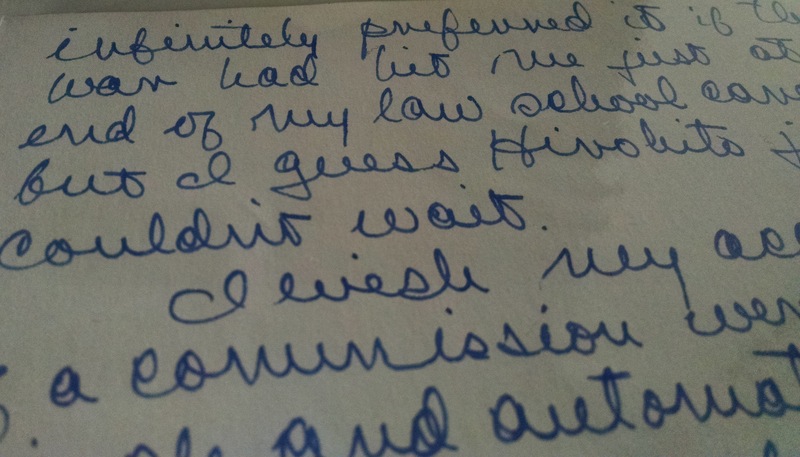 For decades, Phil Wood’s letters existed only as a typed manuscript. Compiled and edited by a loving sister who missed her brother dearly. Circulated to friends and family so they might remember him, too. The echoes became history, and thus became fact. A cherished family heirloom. And lucky it was that she took the time, because the originals were long gone. “I would have infinitely preferred it if this war had hit me just at the end of my law school career, but I guess Hirohito just couldn’t wait.” Letter 3. A great story, but a partial one. The Phil that survived through the seventeen-odd letters was the one his sister remembered. Confident, poetic, tragically doomed and all but flawless. Gone were his periods of depression, the crushing heartbreak, the uncertainty over his future. The poker winnings he sent home to support the family. The sometimes caustic observations on family, fellow Marines, and the way of the world. The intense and volatile emotions of an imperfect young man. But, as sometimes happens with history, a new source came to light. A primary source, written by the subject himself. And it reveals a very different Phil Wood. 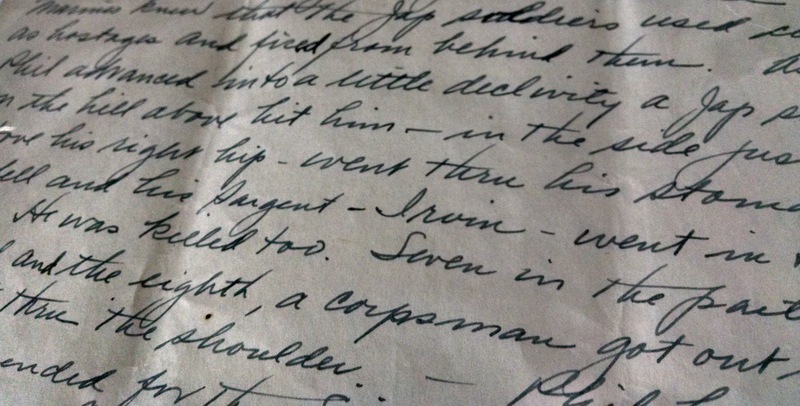 His wartime letters did not number seventeen after all. There are seventy six. And the whole collection is now online. Phil The Ideal is here, of course, but there is also Phil The Unsure, Phil The Arrogant, Phil The Angry, Phil The Imperfect. In other words, Phil the human, with all the traits and flaws that we all have. A letter from James Hardy, who spoke with Phil’s friends just a month after his death. Letter 80. When we think of our heroes–especially those gone before their time–it’s easy to forget that, by and large, they were just like us. And in the end, isn’t that what we miss most about them? Quirks and similarities we find identifiable and human. But, of course, that’s just one historian’s opinion. A personal bias. Read Dear Girls for yourself–whether family or stranger, long-time follower or first-time visitor, researcher or casual browser. It’s history. Listen for echoes. 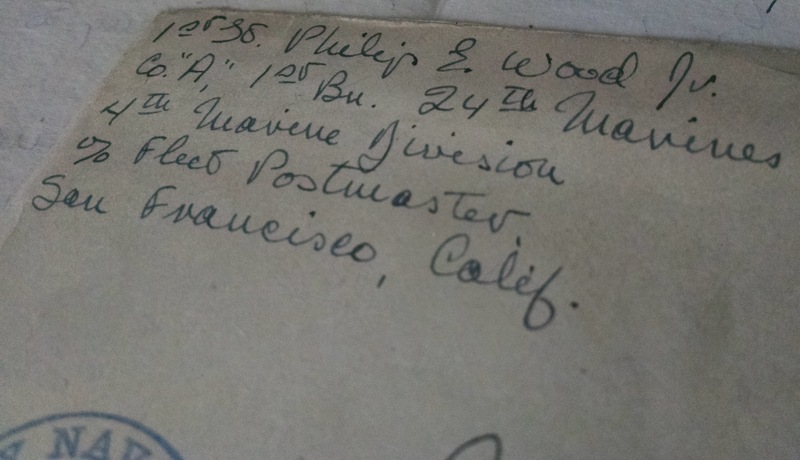 The sign-off from Phil’s last letter home, dated June 8 1944.